A herd of plains bison have been successfully reintroduced to Canada's oldest national park, more than 100 years after they were nearly hunted out of existence. On Monday officials said the transfer had gone smoothly and the animals were adapting well to their new home. The move will restore their role in the park's ecosystem, officials say, and has been welcomed by indigenous groups. The bison will be kept under observation in an enclosed pasture of the park in the foothills of the Rockies until the summer of 2018, Parks Canada officials say. The animals were once the dominant grazers in the park, in addition to being spiritually significant to Canada's aboriginal groups, supplying them with food, clothing and shelter. 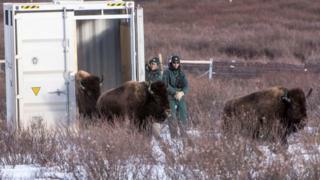 The herd will eventually be released into a far wider area of the park where they will be at liberty to interact with other native animals and search for food, The Calgary Herald reported. It said the hope is that natural barriers and wildlife fencing will stop the bison from wandering astray. "By returning plains bison to Banff National Park, Parks Canada is taking an important step toward restoring the full diversity of species and natural processes to the park's ecosystems while providing new opportunities for Canadians and visitors to connect with the story of this iconic species," Canadian Environment Minister Catherine McKenna said. At one time, there were as many as 30 million bison on the plains but they were hunted almost to extinction with only a handful remaining in government-controlled areas.